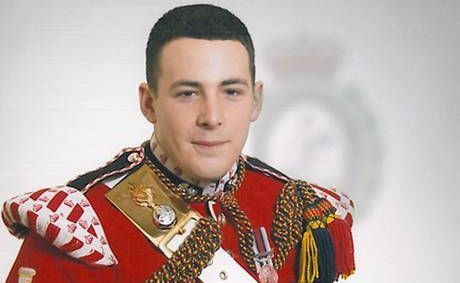 TWO men charged with the gruesome murder of a British soldier attempted to hack off his head in broad daylight on a London street, a court heard as their trial opened. Michael Adebolajo, 28, and Michael Adebowale, 22, are accused of murdering 25-year-old Lee Rigby as he walked to his barracks in Woolwich, south London, in May. The two defendants, both Britons of Nigerian descent who have asked to be identified by Islamic names in court, deny murder. As the trial opened at London's Old Bailey, prosecutor Richard Whittam said the pair had run Drummer Rigby over with a car, knocking him unconscious, before attacking him with knives and a meat cleaver in a "cowardly and callous murder". room as Mr Whittam told the jury of eight women and four men that Mr Adebowale had stabbed and cut the soldier while Mr Adebolajo tried to cut his head off. They had dragged his body into the middle of the road, Mr Whittam said, because "they wanted members of the public to see the consequence of what can only be described as their barbarous acts".